We were due to go to London for the Chinese New Year celebrations, but due to poor weather forecast and the trains being disrupted, we decided to go to Brighton instead and go to Shogun Ramen, somewhere I have been keen to visit for some time. Shogun is situated right near to The Lanes in Brighton, a maze of narrow streets lined with quirky independent shops, eateries and restaurants. Like a lot of independent ramen bars, Shogun is small and unassuming from the outside. Once inside, you are greeting by a kitchen and serving counter that is the length of the restaurant. Stools line either side and to begin with, I thought this was all the space the restaurant had, until we were ushered downstairs into a small restaurant area with chairs and tables. Just after we took our seats, the whole restaurant filled up, which is always a good sign! There was a choice of ramen on the menu, all with pork broth base. I chose the spicy miso ramen with chicken thigh and my husband chose the chicken katsu curry. We ordered seaweed salad as a side, which if you’ve read any of my other reviews, you will know we nearly always order because it is one of our favourites. 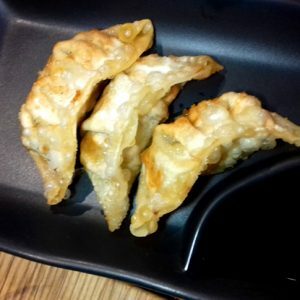 We also ordered chicken gyoza. The food came out really quickly. I guess the broth is kept warm and the toppings just laid one when the orders are placed. I also think that probably they use one broth and add things to it for the different ramen dishes, as although my spicy ramen had a slight hint of chili oil, it was not spicy. The broth itself was far lighter than any I have tried before. I actually quite liked this as I normally leave a ramen bar feeling rather full. The toppings were tasty with sweetcorn (one of my favourites on top of ramen), wood ear mushrooms, pink kamaboko (fish slice), spinach, spring onion, egg and chicken thigh. I loved the simplicity of all the toppings, the chicken thigh just grilled with no marinade and everything just fresh and tasty. The only disappointing part was the plain hard-boiled egg, which is nowhere near as nice as a marinated ramen egg, usually my favourite topping. The noodles were good with just a little bite. I could have done with a little more spicy heat in the broth itself, but it was still really tasty. 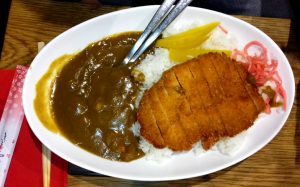 My husband’s chicken katsu curry was really tasty. The chicken was crispy and the curry sauce was the perfect blend of sweet and sour. I love rice almost as much as I love ramen noodles and the rice was cooked to perfection. We were intrigued by the yellow pickle on the plate, which tasted amazing. Apparently it is a pickled daikon/ mooli. Definitely got to look into making this myself! The gyoza were fried with a crispy skin, which I prefer to steamed gyoza. They were tasty and tart with a vinegary dip. 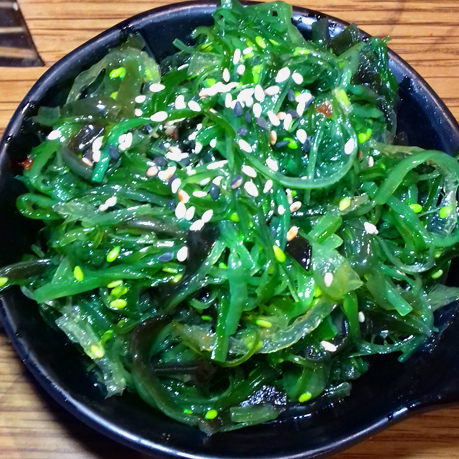 The seaweed salad was just as tasty as it always is when we order from a Japanese restaurant. All in all a very good meal. It’s always good to find a decent Japanese food place near to where we live so we don’t have to travel up to London when we fancy Japanese food! 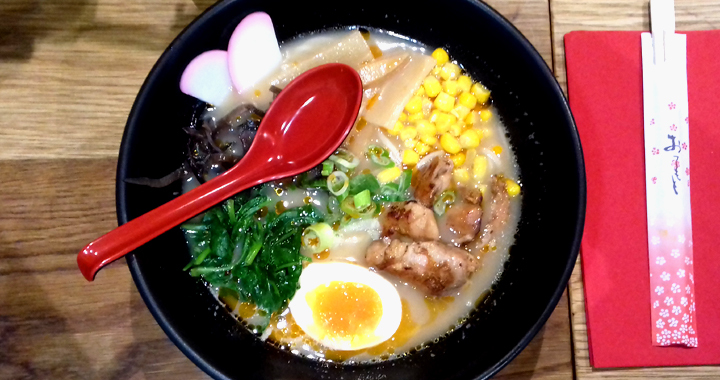 Posted in Restaurant Reviews, Reviews, Uncategorised and tagged Brighton, Ramen, Restaurant, Review.